Horror Movie A Day: HMAD Screening: FROM DUSK TILL DAWN! UPDATE! Schedule permitting, DANNY TREJO will be on hand for pre-show Q&A!!! It's no secret that Quentin Tarantino is part owner of the New Beverly Cinema, which is probably why his movies tend to screen on a regular basis (usually Friday midnights). 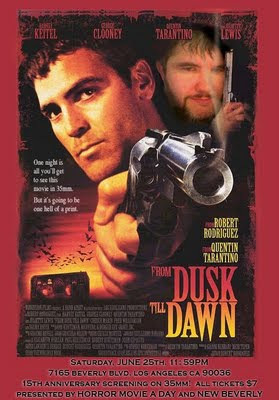 But there's been one notable exception: From Dusk Till Dawn. Now yes, it's directed by Robert Rodriguez, but it's QT's script (his followup feature screenplay after winning the writing Oscar for Pulp Fiction, in fact), and also features one of his biggest (and, in my opinion, best) acting roles. So I couldn't be more excited and just as proud to host what I believe is the first screening of the film there. The screening will occur on Saturday, June 25th, at 11:59 PM. As always, tickets are 7 bucks cash at the door, or online at BrownPaperTickets. The New Beverly is located at 7165 Beverly Blvd in Los Angeles, two blocks west of La Brea. Parking is available on Beverly or the side streets (Formosa being the best), and if you forget cash, there's an ATM at the gas station at La Brea/Beverly. I'm making efforts to secure some special guests (anyone got a direct line to George Clooney? ), but either way I'll have some DVD giveaways and such. Of course, the most important part of any HMAD screening is the photoshopped poster, which you will find below. Feel free to use it when spreading the word via Twitter, Facebook, etc - I want a PACKED HOUSE for this one! Of all the movies I've shown, this is the most crowd-pleasing - I want deafening cheers when Cheech makes his famous "welcoming" speech! See you there! Dude, you need a facebook like button for this stuff! I have always had a seriously huge soft spot for this movie!! I remember when it played here it was slapped with an R-18 rating. At the flicks three 8-9 year old boys managed to sneak in and watch it. It was so funny and I admired their audacity. Cheech's anatomical discourse has gone down in infamy hasn't it?! !